Believe it or not, we don’t have a special vehicle for this. All cakes are delivered using personal vehicles, ranging from roomy hatchbacks and mid-size cars to SUVs. The delivery and set up of wedding cakes is a very serious task and not for the faint of heart! It can be STRESSFUL as every little bump in the road makes you worry what is going on in the back where said wedding cake currently resides. You will suddenly be HYPER aware of every tilt and turn the vehicle makes as you transport this precious cargo to its destination. Finally when you get there – stairs, elevators, and doors become obstacles as you only have so many hands and can’t exactly balance the cake like a box of pizza! Now that the dramatic facts are out of the way, don’t fret! Our drivers are seasoned at this delicate task. If issues do arise, rarely is it anything to do with the cake. Problems we see come from unexpected travel/traffic issues or a facility not being ready for our arrival (for example: incorrect building entry time). Even so, love always prevails and the cake arrives for the big day! 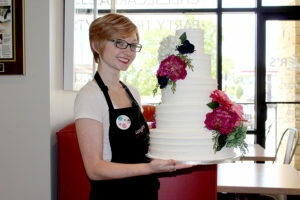 Previous Wedding cake: does size matter? Confectionary tales from Ludger's Bavarian Cakery.